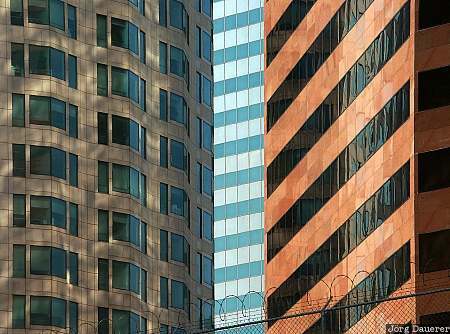 Pattern of the modern architecture of downtown Los Angeles. The long tele-lens condenses the Skyscrapers to a flat structure. Los Angeles is in southern California on the pacific coast of the United States. This photo was taken on a sunny day in October 2002. This photo is part of the exhibition Urban Patterns (June 2017). This photo was taken with a digital camera.